In the time of the dinosaurs, we rolled gigantic analog mixers to front of house, connected fire hose-sized snakes, tons of outboard gear and dashed back and forth over the length of the console as we mixed the show. The 1990s brought digital technology, which, although in its infancy, made our lives easier in many ways. Fast-forward to today, where our consoles’ digital hardware sometimes lives backstage (or onstage) controlled by a slick, efficient control surface at the FOH position. Meanwhile, this high-tech has trickled down to a wider market, offering tablet or large smartphone remote mix control even to ramen-eating bands living out of vans. 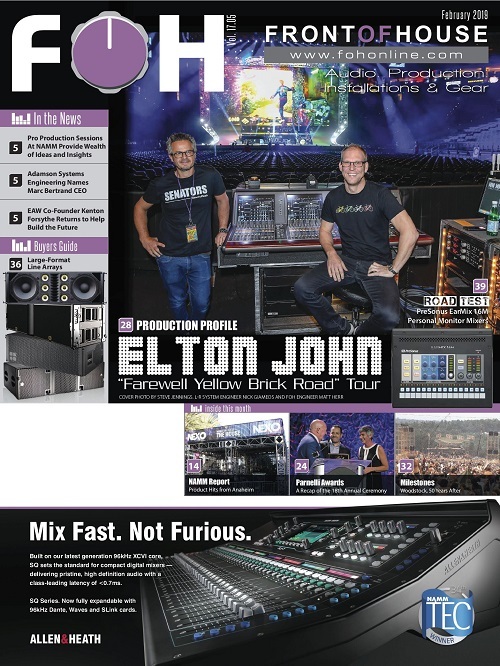 Indeed, remotely mixing from anywhere in the venue with a handheld control surface has become more and more popular, particularly for touring acts who want to limit the weight and physical size of their audio system. 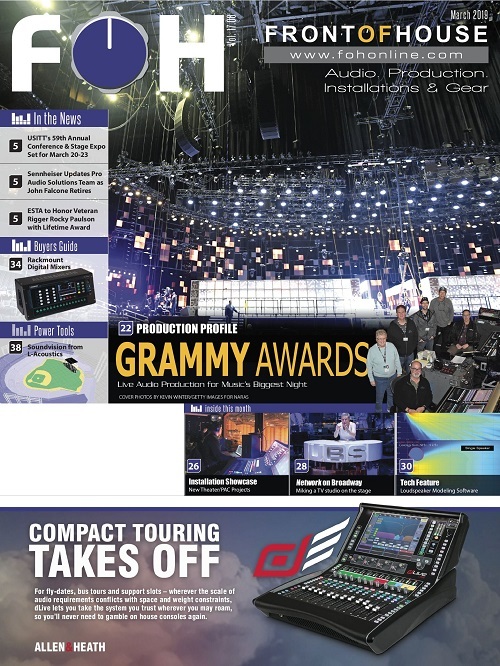 As a bonus, artists on stage can dial in their own IEM or wedge mixes with handheld devices. And in many cases, 100 percent of the external hardware formerly located at FOH now resides inside the mixer itself. Another welcome development? We no longer need those bulky analog snakes. 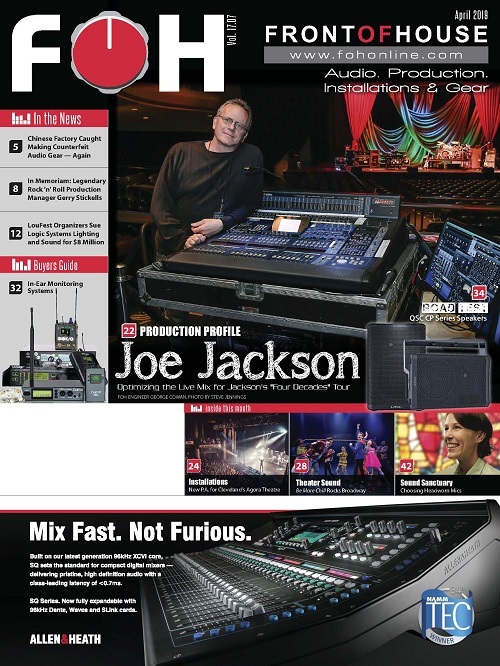 Mackie has introduced an update to its popular DL mixer series: the DL16S and DL32S. In many respects, these new models are similar to the earlier DL32R mixers, but without Dante functionality (and at a substantially lower price). If Dante connectivity is not important to you, these mixers essentially provide all the same functionality as the earlier DL mixers. Mackie touts its “built-like-a-tank” aesthetic, and in the case of the new DL line, I would assess it as a fair and accurate description of the physical enclosure. Unlike the previous DL series’ “this-definitely-goes-in-the-rack” sensibility, the new units exhibit an unmistakable stage-box form factor, but they are rack-mountable nevertheless. The front panel of the DL32S features 32 inputs, half of which are the traditional three-prong XLR variety, and the other half are the combo connectors that accommodate XLR or ¼-inch plugs. There are eight multi-purpose XLR outputs, and a stereo pair of XLR connectors representing the mixer’s main two-bus output. The DL16S is essentially half that, with eight of each kind of input XLR jacks, six multi-purpose XLR outputs, and a pair of XLR outputs presenting the main two-bus mix. The front panel also sports USB and Ethernet jacks, LEDs indicating power and Wi-Fi connectivity, and a ¼-inch headphone jack with level knob. An IEC power socket and main power switch are located on the right end of the unit, and the carry handle that calls “stagebox” to mind is located on the left end. This handle can be removed and the unit can be rack-mounted with its included rack ears. A 2.4 GHz Wi-Fi antenna is nestled into a front-panel cradle to protect it when it’s not being used — the antenna rotates upward during use. If the system’s internal 2.4 GHz Wi-Fi is not suitable for any reason, the front panel Ethernet jack facilitates connection to any Wi-Fi system you’d like to use. Similarly, that jack provides wired operation for those who prefer its relatively higher reliability. The mixer’s USB port facilitates multi-track recording or playback of backing tracks during performance or walk-in or intermission music. Another appreciated function of the USB port is the capacity for virtual sound checking. The Master Fader main screen is easy to navigate. In the days of the dinosaurs, a mixer was a physical device that contained all of its inputs, outputs, and controls in one enclosure. After having reviewed many mixers in my days, I’m struck by the curious phenomenon presented by remotely-controlled hardware such as the Mackie DL mixers — namely that while I formerly wrote about a single unit with I/O and controls all contained within, I’m now writing about a piece of hardware and a separate application — two distinct entities. I’ll refer to the various signal processing as if it were part of the application (despite the fact that it is physical hardware contained in the physical box). Mackie has recently updated its Master Fader app to version 5.0, which is necessary for the operation of the DL16S and DL32S mixers. Mackie’s website spells out a release date “roadmap” indicating that version 5.1 (a substantial upgrade that makes the app available for Mac OS and Windows) will be introduced around “early 2019,” to be followed by 5.1.1, which will offer support for Mackie’s DC16 control surface. I have no formal confirmation of this, but I would not be surprised to see an upgrade revealed at NAMM in late January. Master Fader is the only means by which to control the system’s hardware — channel levels, panning, sends, returns, VCAs, effects and so on. It features buttons that allow quick navigation to three main displays: overview, mixer view, and channel view. The overview is just that — a look at all the mixer’s faders simultaneously, including sends, returns and VCAs. 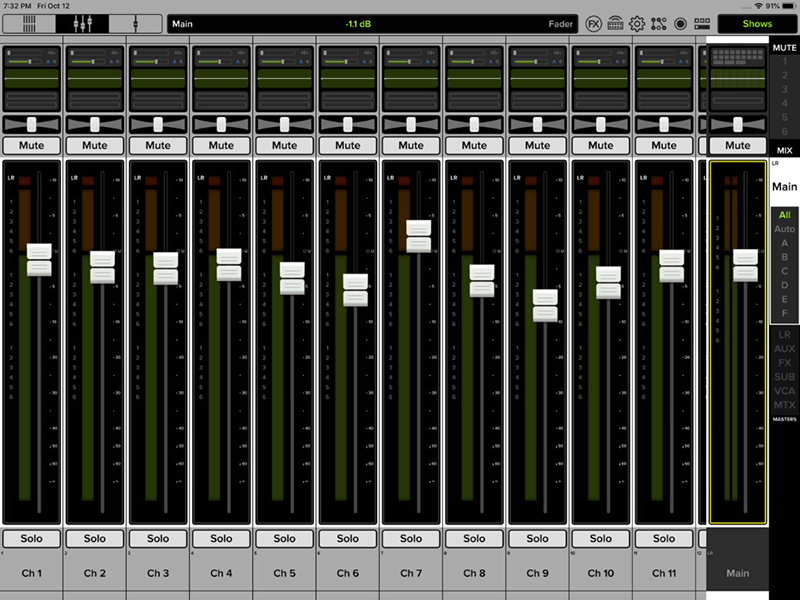 The mixer view is likely to be front and center most of the time for most users — the literal view of the mixer’s main faders, panning, and mutes. Channel view shows us all the details of a selected channel, including controls for the channel’s gate, compressor, EQ, routing, panning and so on. One Master Fader feature I really appreciate in the app’s graphical user interface is Mackie’s “Grow & Glow” convention, where any knob, fader, slider or button you touch grows larger and takes on a glowing halo as you adjust it. There’s no mistaking what parameter you’re affecting. Channels can be easily named and color-coded, and an image associated with each, either from a library of icons or a photo from the control device’s storage (or taken right there on the spot) — very clever. Swiping left and right shows all the available input channels, and they can be linked and parameters can be copied and pasted between them as well. Channels can be subgrouped or included in VCA, mute and view groups, too. At all times, there’s an “FX” button at the top of the display giving us instant access to the mixer’s four effects units. There are several types of reverb available, along with delays and modulation effects like chorusing, flanging, phasing, tremolo, and rotary. These algorithms sound good and offer an array of control parameters so they can be adjusted to one’s liking. The main channel EQs offer up to four bands of fully parametric operation, and can be toggled between “modern” and “vintage” (that bears a striking resemblance to classic Neve hardware). Similarly, each channel sports (along with its gate) a modern compressor and a vintage version, the graphical user interface for which resembles the venerable 1176 compressor. Of course, all mix parameters can be stored and instantly recalled, providing a huge head start in putting together a mix for each evening’s new venue. 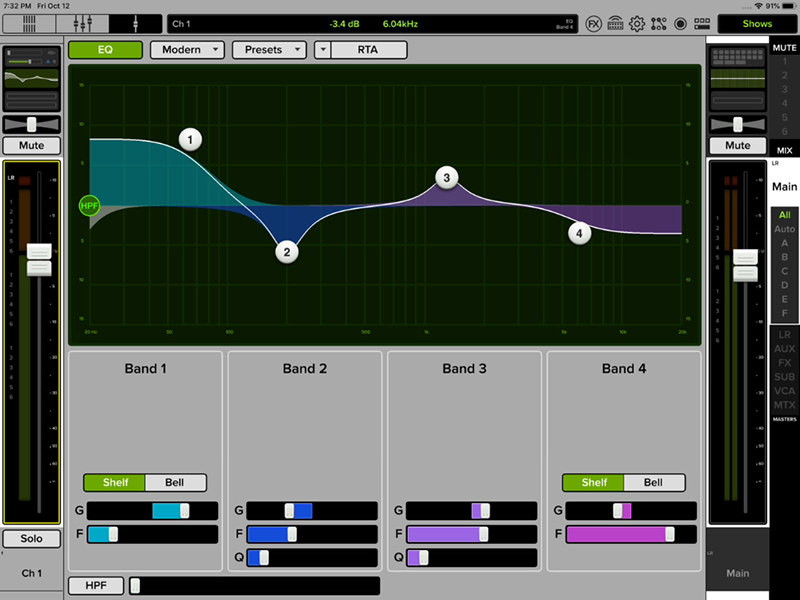 Each channel has a 4-band, fully parametric EQ. As an audio engineer, I’m comfortable with both computer GUIs and traditional faders and knobs. As a result, I’m not averse to using a similar touch-screen interface to mix live shows, and we’re all evolving in this direction. I had no trouble navigating the app and quickly putting a mix together every bit as quickly as I could with a hardware mixer. 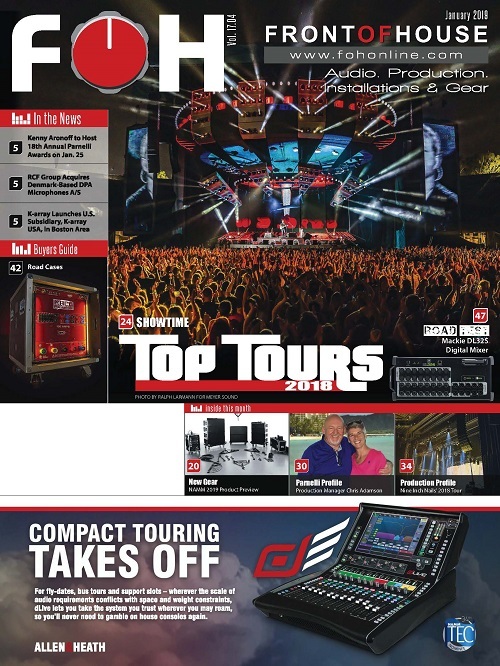 Mackie is advancing this development with products like the DL32S and DL16S. The biggest advancements we see with the DL32S and DL16S are support for multiple platforms, including Apple iPhones and iPads, Android devices, and — with impending software revisions — Mac and Windows computers as well. It’s great to see all these competitors playing nicely together. So if our drummer is an iPhone user, the bassist is an Android user and the keyboardist has a MacBook as part of her rig, they can all adjust their own monitor mixes simultaneously on the DL32S and DL16S — up to 20 devices at once. Another nice touch is the inclusion of Wi-Fi right inside the mixer hardware — no need to provide our own (although we can if we care to). These are substantial advancements, and increase the appeal of the system. The mixers are well designed, solidly executed and easily operated, while they providing an excellent value. If you are thinking about moving into the domain of remotely controlled mixers, the Mackie DL32S and DL16S are very worthy of consideration. Mackie has updated its popular DL mixer series with two affordable new models that pack a punch in a compact chassis — a good choice if Dante connectivity is not important to you. 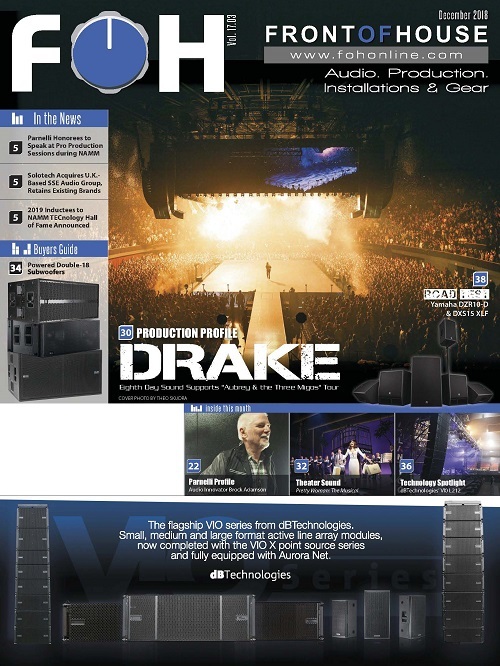 While the design suggests a stage-box form factor, they are rack-mountable. These mixers are well designed and user-friendly — and definitely worth checking out. John McJunkin is a freelance engineer and writer based in Arizona.